In this section you are invited to read about some terms that might be interesting to know for the implementation of hyperspectral technology in industrial applications. This section will be continuously extended. What is Chemical Colour Imaging? Dramatic simplifications in handling, as well as the opportunity for real-time processing of highly complex camera data, are the keys to an extensive industrial use of this chemical camera technology. The abstraction of highly complex spectral information through chemical features makes handling of the cameras on a deep level accessible to the user and interpretable, even without a profound knowledge of the basic technologies. New aspects of dealing with chemical information arise and these accelerate continuous further development of Chemical Colour Imaging. Chemical Colour Imaging aims at a holistic approach considering the advantages of spectroscopic and image processing techniques. Hyperspectral cube data are described by colour images holding spatial information together with spectroscopic information coded by colour. Such a data format allows the perception of targeted information in a high-dimensional data set (like a cube) as well as the co-processing by means of (colour) image processing methodology. As a consequence, the validation of gained perceptions can be realized by a manually or automated comparison with expectations. This circumstance simplifies the process of configuring of hyperspectral data processing (to point out specific spectroscopic information) enormously. Chemical Colour Imaging is applied typically by solution providers, like instrument builders, for industrial purposes. Its main markets today are recycling, food, mining and also the pharmaceutical industry. By adapting a hyperspectral camera with a real-time processing core, Chemical Colour Imaging turns the camera system to an easy-to-understand and intuitive configurable “chemical colour camera”. Since the output data is in a standardized machine vision format, all available image processing solutions can be facilitated for tasks like decision generation, counting or monitoring based on chemical information. Ratings of distributions of chemical and physical information by using image processing methods. TheChemical Colour Image on the left shows raisins with impurities in between (paper, plastic). The blue and green arrows point two spectral positions of raisins. In the graph on the right it can be seen that points with similar colour also have similar spectra behind. The red arrow points a different colour. Consequently the spectrum (paper) is also different from the raisin spectra. The figure above shows the process of an inline Chemical Colour Imaging solution. In the first step an unsupervised colour preview of a hyperspectral data cube is generated. Along this preview spectra or spectra sets of the objects can be selected and analyzed. By the intuitive use of predefined chemical property extraction modules, spectral features can be evaluated and defined. A Chemical Colour model is generated automatically by selecting relevant property scores (resulting from defined features) for the RGB-channels. The generated RGB-image is then transformed to the HSV colour space which opens easy possibilities for a colour classification. Additional to the chemical object classification, more object properties can be collected and a final decision for the object can be made. 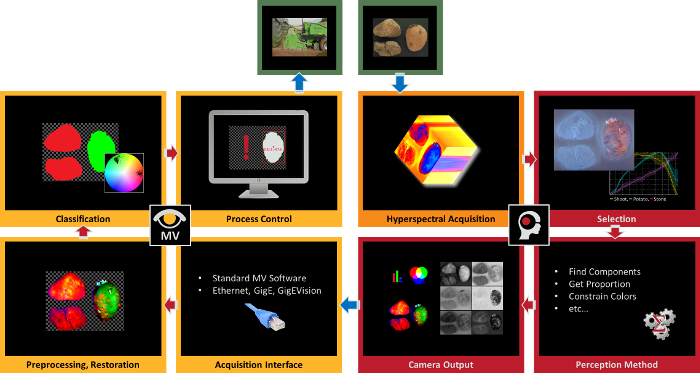 By combining the advantages of hyperspectral imaging with the advantages of industrial image processing, new innovative machine vision solutions can be developed. To develop applications based on hyperspectral cameras it was usually necessary to seek advice from experts of chemometry and spectroscopy. - Till now! By Chemical Colour Imaging hyperspectral cameras are integrated into existing image processing systems. By intuitive configuration options, chemical properties are extracted using established chemometric methods. By combining three properties, a colour impression (representing chemical relations information) is generated which is simple to understand and can be processed by image processing methods. The resulting Chemical Colour Image of a scene shows object properties in Chemical Colours which do not represent the physical property colour. Instead objects with similar molecular structure are represented by similar colours; different objects by different colours. Center: CCI-preview of different plastics; right: Chemical Colour Image of different plastics. The Chemical Colours correlate with the molecular structure of the samples. The dashed line marks the moment of record shown in the left handed image; Left: Hyperspectral image at a specific moment. Spectral information is shown horizontally and spatial information is shown vertically. Hyperspectral imaging, like other spectral imaging, collects and processes information from across the electromagnetic spectrum. Much as the human eye sees visible light in three bands (red, green, and blue), spectral imaging divides the spectrum into many more bands. This technique of dividing images into bands can be extended beyond the visible. Engineers build sensors and processing systems to provide such capability for application in agriculture, mineralogy, physics and surveillance. Hyperspectral sensors look at objects using a vast portion of the electromagnetic spectrum. Certain objects leave unique 'fingerprints' across the electromagnetic spectrum. These 'fingerprints' are known as spectral signatures and enable identification of the materials that make up a scanned object. For example, a spectral signature for oil helps mineralogists find new oil fields. This enhanced ability increases the probability of detecting materials of interest and provides additional information necessary for identifying and classifying these materials. Hyperspectral cubes are generated by hyperspectral imaging sensors. Hyperspectral sensors collect information as a set of 'images'. Each image represents a range of the electromagnetic spectrum and is also known as a spectral band. These 'images' are then combined and form a three-dimensional hyperspectral data cube for processing and analysis. The precision of these sensors is typically measured in spectral resolution, which is the width of each band of the spectrum that is captured. If the scanner detects a large number of fairly narrow frequency bands, it is possible to identify objects even if they are only captured in a handful of pixels. However, spatial resolution is a factor in addition to spectral resolution. If the pixels are too large, then multiple objects are captured in the same pixel and become difficult to identify. If the pixels are too small, then the energy captured by each sensor cell is low, and the decreased signal-to-noise ratio reduces the reliability of measured features. Chemical imaging is a special case of hyperspectral imaging. While hyperspectral imaging is a general term for spatial resolved spectroscopy, chemical imaging just covers the disciplines where chemical properties are of interest. The main idea: For chemical imaging, the analyst may choose to take as many data spectrum measured at a particular chemical component in spatial location at time; this is useful for chemical identification and quantification. Alternatively, selecting an image plane at a particular data spectrum can map the spatial distribution of sample components provided that their spectral signatures are different at the selected data spectrum. Imaging instrumentation is composed of three components: a radiation source to illuminate the sample, a spectrally selective element, and usually a detector array (the camera) to collect the images. When many stacked spectral channels (wavelengths) are collected for different locations of the spectrometer focus on a line or planar array in the focal plane, the data is called hyperspectral; fewer wavelength data sets are called multispectral. The data format is called a hyperspectral imaging cube. The data set may be visualized as a hyperspectral data cube, a three-dimensional block of data spanning two spatial dimensions (x and y), with a series of wavelengths (lambda) making up the third (spectral) axis. The HSI cube can be visually and mathematically treated as a series of spectrally resolved images (each image plane corresponding to the image at one wavelength) or a series of spatially resolved spectra. Many materials, both manufactured and naturally occurring, derive their functionality from the spatial distribution of sample components. For example, extended release pharmaceutical formulations can be achieved by using a coating that acts as a barrier layer. The release of active ingredient is controlled by the presence of this barrier, and imperfections in the coating, such as discontinuities, may result in altered performance. In the semi-conductor industry, irregularities or contaminants in silicon wafers or printed micro-circuits can lead to failure of these components. The functionality of biological systems is also dependent upon chemical gradients – a single cell, tissue, and even whole organs function because of the very specific arrangement of components. It has been shown that even small changes in chemical composition and distribution may be an early indicator of disease. Any material that depends on chemical gradients for functionality may be amenable to study by an analytical technique that couples spatial and chemical characterization. To efficiently and effectively design and manufacture such materials, the ‘what’ and the ‘where’ must both be measured. The demand for this type of analysis is increasing as manufactured materials become more complex. Chemical imaging techniques is critical to understanding modern manufactured products and in some cases is a non-destructive technique so that samples are preserved for further testing.